This procedure details the steps needed to install the InventoryCloud mobile program to the WDT92 mobile device over a data cable. 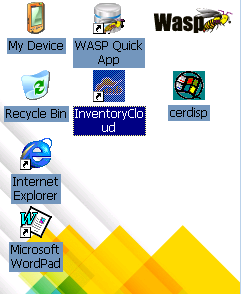 Connect the device via USB to a Windows PC, so that it shows as connected in Windows Mobile Device Center. If needed, troubleshoot with procedures documented elsewhere. 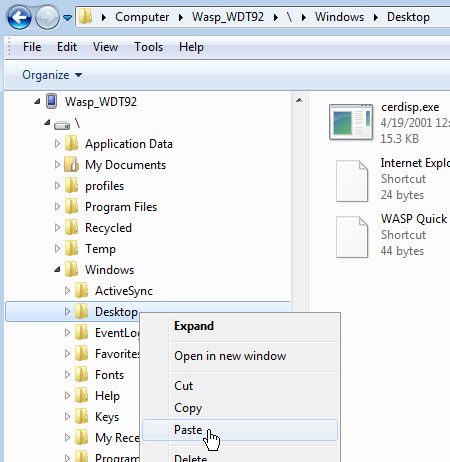 Right-click the Desktop folder, then Paste. You should see these files appear on the device's desktop screen. Double-tap to install each of the 4 files from the list above (the order of installation does not matter). 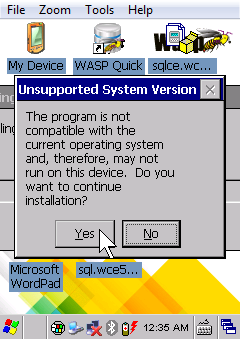 Tap Yes to continue on any message about "Unsupported System Version". In the screen asking where to save the file, do not change anything; just tap the OK button at the upper right corner. Repeat the process until all three listed files are completed. 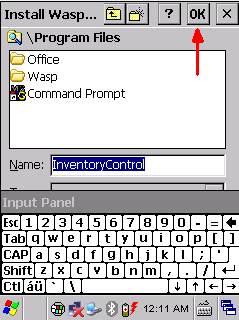 Right-click and copy the InventoryCloud.lnk file. This is a 1 KB file of type Shortcut. 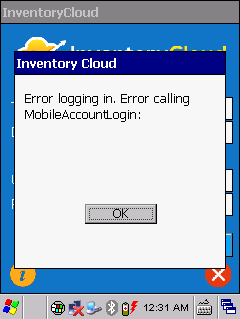 On the device, you should see the InventoryCloud shortcut. It is ready to use. ... the device doesn't have internet access. See the link below in Related Pages: "WDT92 connection to wifi network" then retry the InventoryCloud login.